It honestly wasn’t my intent to do another “Astonishing Art” so soon after the last one. Much less another dedicated to the Teenage Mutant Ninja Turtles. But today’s piece popped up in my Instagram feed today, and I simply couldn’t resist. Chances are at some point you’ve seen the image at right, or at least some version of it. It’s the classic Norman Rockwell painting “The Runaway,” which made its debut on the cover of The Saturday Evening Post in 1958. It’s textbook Rockwellian America. 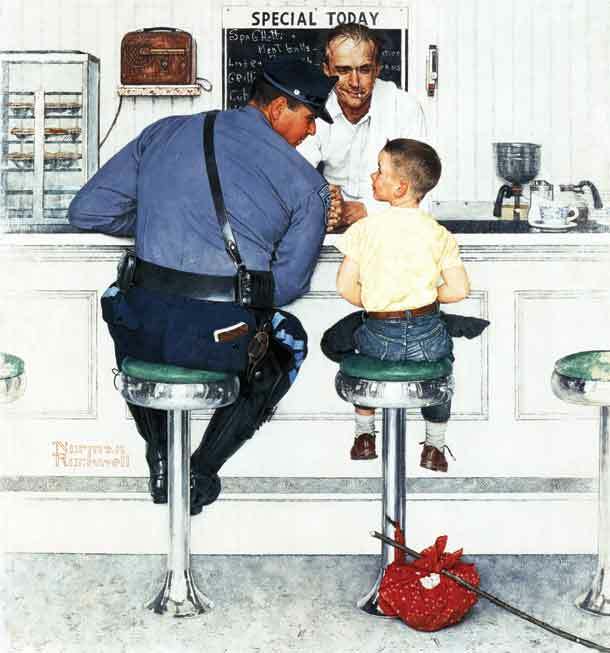 A naive young runaway sits in a diner under the protective eyes of a policeman and the counterman. As one might imagine, artists have been tipping their hat to it for a long time. Cast in point, our subject today: A TMNT-inspired spin on “The Runaway” by Matt DeMino. This piece first appeared on the official TMNT Twitter account yesterday. Damn. Right in the feels. Especially as an ’80s kid who grew up on a steady Ninja Turtles diet. Who among us didn’t run around with a pillow on our backs and a ninja headband on? The boys in green were our heroes, This image could have been plucked from the dreams of a million kids back then. It still could today. 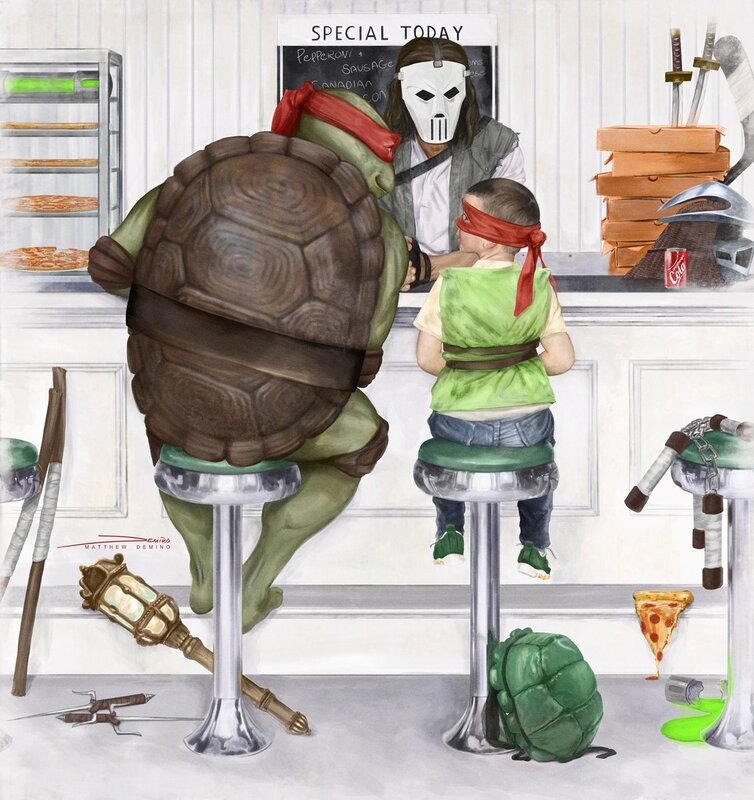 This isn’t the first time DeMino has been commissioned to work on the Ninja Turtles. The piece at left came out on Thanksgiving last year. Note the same analog Coke can design in both scenes. Clearly, DeMino’s take on the Turtles and Splinter is very reminiscent of the old movies. Hey, that’s how I’d do it too. That original Steve Barron film is still the definitive presentation of the TMNT, for my money. After all these years, it still holds up. 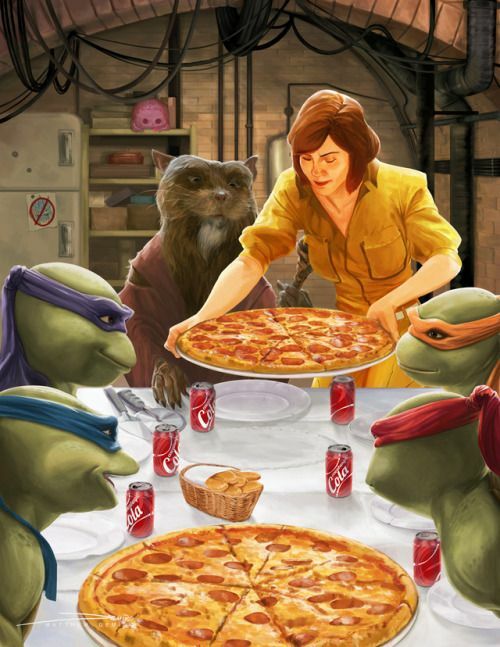 This entry was posted in Uncategorized and tagged April O'Neil, Astonishing Art, Casey Jones, Donatello (TMNT), Leonardo (TMNT), Master Splinter, Matt DeMino, Michelangelo (TMNT), Ninja Turtles, Norman Rockwell, Norman Rockwell Saturday Evening Post, Norman Rockwell The Runaway, Raphael (TMNT), Teenage Mutant Ninja Turtles, Teenage Mutant Ninja Turtles II: The Secret of the Ooze, Teenage Mutant Ninja Turtles III, Teenage Mutant Ninja Turtles: The Movie, The Runaway, The Saturday Evening Post, The Shredder, TMNT on 05/11/2018 by primaryignition.